I remember arriving in Indiana for the first time more than 15 years ago; it was late August and the heat was staggering. My clothes stuck to my body, my hair frizzed, my energy zapped an hour after I left the house . . . this Northwest girl was not used to that kind of humidity. By October, Jack Frost had already had his way with the pumpkins and when November rolled around, snow had fallen; my first semester of classes ended the first week of December with a whopping high of 18 degrees and ice on the ground . . .
I’ve always enjoyed the changing of the seasons; it reminds me of the changing of the guards at Buckingham Palace . . . new Sentries will patrol the perimeter until Mother Nature sends in fresh recruits at the beginning of the following season – each one bringing its ‘A-Game’ for us to admire. As I look out my windows on this gray, rainy day, I see rain-slicker yellow, emergency-cone orange and fire-engine red leaves dotting our trees. Quite a few have already fallen onto the deck and into the yard . . . all will be completely gone in another week or so. The scent of fall is in the air, I’ve pulled out the sweatshirts, jackets and boots; flip-flops, tank-tops and warm weather clothes have been packed away. Bonfires are burning in the neighbors’ yards and I imagine we’ll mow the grass one more time before we get a freeze. It’s time to put the garden beds to sleep for winter, plant Spring bulbs and net the fish pond. Now is the pause in our year before the holiday crazy hits; days are shorter, nights are longer and the fireplace was lit for the first time this week. The Professor is completing week 9 out of 16 in his semester; I’m gearing up for overnight company and entertaining . . . six birthdays are celebrated in October, two celebrated in November, Thanksgiving, a wedding to shoot in December, Christmas and New Year. And while I’m looking forward to experiencing every single event, I force myself to savor today . . . to savor this moment . . . to not miss what’s right in front of me because I’m busy looking ahead and making my plans. At the moment I’m remembering dear friends on the West Coast: Julie, Connie, Judi, Gayle Chris and Carol (Carol now lives here in the Midwest). The arrival of Fall meant craft days to make gifts or decorations for the upcoming holidays; it meant card nights, it meant practicing for the children’s Christmas musical, it meant decorating with pumpkins and mums. Much has changed in the 15 years since I left that hot August day; kids have grown and married, parents and grandparents have passed, grandbabies born and we’ve all gotten older . . . but those fall moments are memories I cherish. Fall also reminds me of apples, apple cake and another friend, Drenda who baked fabulous apple cakes or apple muffins and would invite guests over to have conversation and enjoy a cup of tea with a slice of that cake. I still have Drenda’s recipe scratched out on the back of an envelope . . . I’ve tweaked it some and baked them in mini bundt pans . . . Happy Fall my friends . . .
**SMITH BITES NOTE: I use a mix of firm tart apples here: granny smiths, gala, figi, pink lady, etc., and I don’t peel them because I happen to like the added texture but feel free to peel your apples if you prefer. You can also grate the apples but again, personally, I like the texture small apple chunks add to the cake. This looks just wonderful! I love the combination of the maple syrup and apple cider. Mmm, love these little cakes. Also love that song by the Plain White T’s, it’s one of my favourites. Beautiful presentation! I just love the maple syrup, if that wasn’t enough to lure me – the photographs are! Beautiful recipe, Debra! Really blown away by how great these cakes look and the flavours are definitely calling out to me. Love the pictures, some of my favourite from you! Great post. All the right flavors in the perfect package! Makes me feel all warm and cozy inside! What a marvelous recipe, Debra! And I’d get to use my mini bundt pan too! I love fall and remember well the apples, cider, donuts and the crisp air. I miss it in Florida, but we did get kind of chilly last night. It was lovely to wake up to this AM. 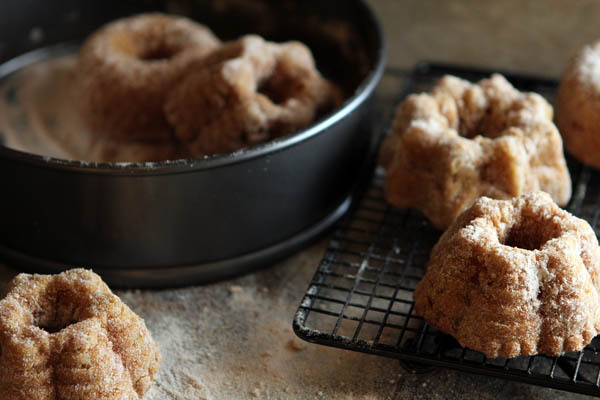 I recently made some little apple cake bundts for a Bake Sale that were a huge hit – I’ve got to make yours! I just love them. while I am SO looking forward to the holidays, I do really try to keep this perspective, be present with it all, enjoy every moment! these cakes sound perfect – great flavors for fall. I am getting a feel of Autumn here in Serbia for the first time since we left Ohio several years ago. It rained all day today, and even though I love all the apples, pears, and quinces my dad keeps on bringing from his ranch, I have to say that I miss sunny California! And who says that you cannot make these beautiful cakes under the clear skies, wearing only a T-shirt? You do have a lot to do in the upcoming months, but all the occasions are happy and exciting! Have fun! Oh how I needed to read this today as I scramble about trying to accomplish too many tasks in too little time. I cherish Fall as well. I’d be so sad if I just “muti-tasked” it away. Such sweet little cakes that speak volumes. Thank you. Thanks for the reminder to savor the moment while we try to prepare for what’s around the corner too. It’s very easy to get sucked into planning and thinking ahead and we forget what’s going on right now. Hope your weekend is a good one! I love autumn, love it. It’s my favorite season and I wish that I lived somewhere with a more pronounced season. We have now moved into crisp, bright days and cool, cool weather and I love it. And yes, this means apple cake! I love yours! Gorgeous and tempting. I love the pan – almost bought one like it for myself and now I think I may. But what a beautiful cake and beautiful photos. Wonderful post. You’re right pretty soon we will all be consumed by the holidays, this is a time to be savored. 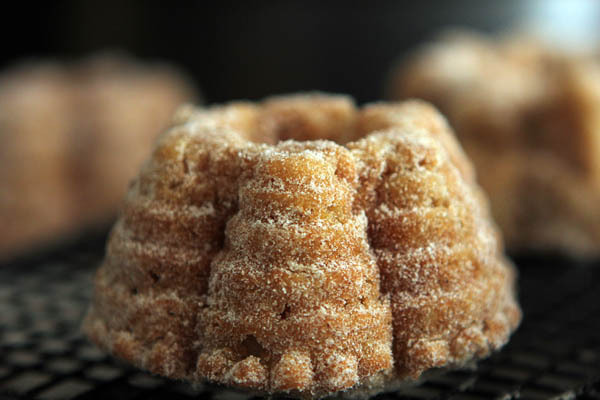 I love baking bundt cakes and the small ones especially! These look gorgeous! I have to give these a try soon. I don’t have a mini bundt pan. Do you think I could use a cupcake tin instead? If so, how would I adjust the cooking time? I really want to make these tomorrow! They look amazing. I am so excited. Earlier this week, my husband was talking about how he loves to combine cinnamon apple oatmeal and the brown sugar maple oatmeal. He looked at me and said can you make it as a cake version? So I started thinking…I told him I could do my caramel apple cake…BUT this fits the bill perfectly. Can’t wait to try it out this weekend. I was just taking a pause the other day while out for a walk. It is so beautiful out this time of year, and we have about a month before the holiday busyness hits. I hope to savor every day between now and then…by the way, love these little cakes. Whoa whoa whoa these apple cakelettes look incredible. Now I don’t want tp publish mine I will just refer everyone to yours:). Great job. Look spectacular! Isn’t great friends inspiration?! I was just thinking yesterday that even though fall is it’s own season it always feels like it’s the between of summer and winter. A time to slow down and enjoy the shorter days and dark mornings. Once the holidays hit, it’s on. And, cakes like this are the reason I will never give up sugar. Ever. Debra, such a beautiful & reflective post 🙂 The cakes look amazing. A great tribute to my favorite time of year. I love these! Cute and delish! I have that same bundt pan; now I think I need to find that little buggar and get to work! Lovely. I also enjoy the changing of the seasons, but I think the change from summer to fall is the absolute best time of year…especially because I love fall foods. Deb, I need these in my life. These look delicious. And I love your little bundt pan! You are lucky to have fall. We don’t really see it much at all here in SoCal! Yes, it is definitely that time of year. The weather has turned here with a 40 degree drop in one day. The soup was on and a cake in the oven yesterday. It’s funny how we all have the urge to bake cakes as the weather changes. 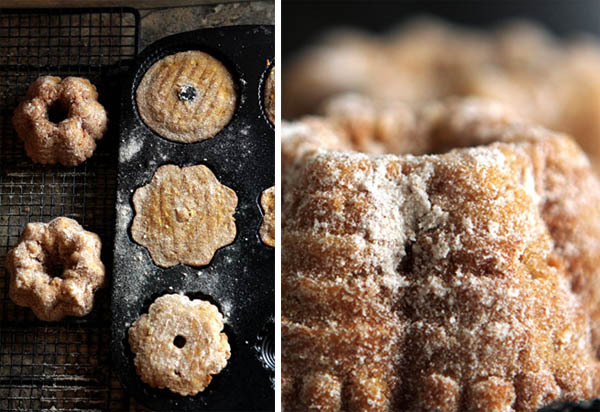 These are perfect for fall and I love the mini bundt pans.